The Icefields Parkway is such a beautiful stretch of highway that you may just want to spend a couple days driving up or down, taking in all of the hidden treasures along the way. If you do chose to go in the late fall, winter or early spring, just be prepared. Make sure your car is winterized with winter tires and pack blankets, warm winter clothing, candles, food, water, as well as first aid kit in the event you are stranded due to icy road conditions or heavy snowfall. Now, I don't mean to scare anyone! I have travelled the Parkway in the winter many times. If road conditions are good, the drive is great. Less traffic than in the summer, beautiful snow-covered vistas and great winter activity access such as backcountry X-country skiing or telemarking and ice climbing at the Weeping Wall. For those of you who love winter photography - now is the time! (Some look-out points are not plowed out in the winter but there are plenty of worthy views! Temporary road closures, (as much as 3 days) after heavy snowfalls, do occur as road crews work to clear the highway of snow and avalanche debris. Be sure to check road conditions before you go, and if there are no open or available accommodations on the Parkway, you can always stay in Jasper. Want to get away from it all? At Simpson's Num-Ti-Jah Lodge, located right at the shores of Bow Lake, you can get back to the basics. There are no phones or TVs in your room, but rather wonderful hiking and fishing adventures awaiting you outside your window. 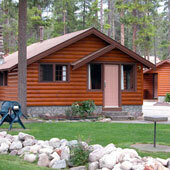 This little lodge has 25 rustic rooms with shared or private washrooms. The restaurant is cozy with a large stone fireplace where you can have a spectacular dining experience. 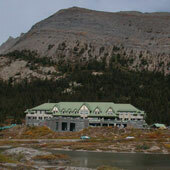 The lodge closes after the Canadian Thanksgiving long weekend in October 7th and reopens late October/early December. 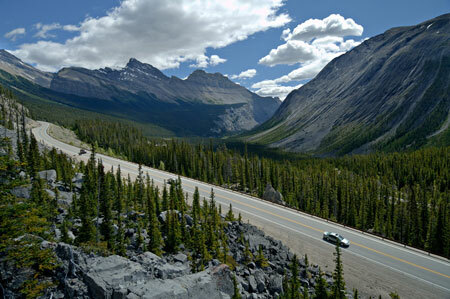 Take in the mountain view on the Columbia Icefield Parkway and stay at the Crossing! With 66 motel-style rooms, this cozy resort allows you to take in the mountains from standard and family units. Most rooms have two double beds, a bathroom, satellite TV and a telephone. Family rooms and Executive Room available. For all you pet lovers!! There are also "pet" rooms available where your pet can stay with you. Take advantage of the spa, cafeteria, dining room, pub, gift shop and service station. The Crossing is open March through to October. Wake up to a glacier! Stay right at the Columbia Icefield and enjoy the view from one of their 32 guest rooms. Space is plentiful and the kids will love the satellite TV and loft area! This accommodation is available from May through to October. 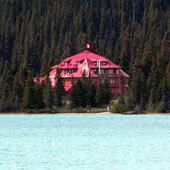 Sunwapta Falls Resort is located between the Columbia Icefields and Jasper townsite in Jasper National Park. This resort offers cabin-living on the edge of a forest and is only a short walk to the Sunwapta Falls. Reserve a table at the Endless Mountain Chain Lounge and enjoy a delectable dinner next to a cozy fireplace for a dining experience to remember. There is a well-stocked cafeteria where you can pick up a light meal of snacks for your busy day of adventure! Picnic lunches can also be arranged. There are three types of suites available but a typical room consists of two double beds, a fridge, a private bathroom and a sundeck. Pets are allowed here at an additional cost! 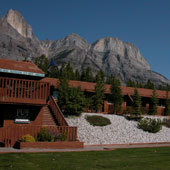 The Sunwapta Resort is open from May through to October. With Log, Deluxe Log, as well as Family Deluxe Log Chalets available, anything from a romantic get-away to a family retreat is possible. 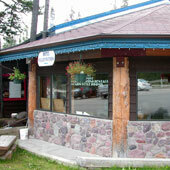 On-site facilities include a restaurant, gift shop, playground and laundry. The restaurant is open for breakfast buffet as well as evening dining. Pets are unfotunately not allowed. Becker's Chalets are wheelchair accessible and are open from late April through to the Canadian Thanksgiving weekend in early October. 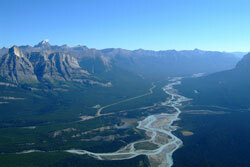 ICEFIELD PARKWAY ACCOMMODATIONS: DON'T BE SURPRISED!! Remember that accommodations along the Icefield Parkway in the winter months are slim!! Num-Ti-Jah Lodge is your best bet with only a 6-7 week winter closure. 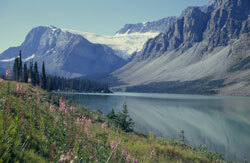 Icefield Parkway accommodations are limited. Make sure you plan ahead and book accordingly.